Learn to dive in Playa del Carmen, where you'll get your first scuba experience in a gorgeous location on the Caribbean Coast. 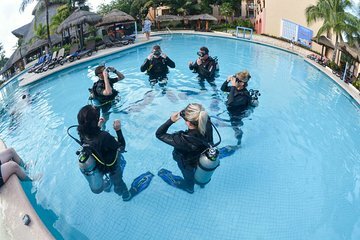 This 3-Day PADI Open Water Diver Course covers scuba diving theory and technique, and includes classroom work, confined water dives, and open water dives, where you'll put to use your new skills. Upon completion of the PADI Open Water Diver Course, you'll be qualified to dive to 60 feet (18 mt.) at sites around the world.